Growing up on a small farm in rural Clackamas County, Steve learned at an early age to appreciate and respect the wide range of animals who shared his life. From raising three Airedale Terriers to spending nearly ten years in horse 4-H, a deep understanding of the human-animal bond was developed and nurtured. His life-long dedication to animals naturally led him to a career as a veterinarian. Steve emphasizes preventative medicine and strives to offer comprehensive healthcare that fits the needs of his patients and their families. He has special interest in feline and canine diabetes management, internal medicine, endoscopy as well as dental care and surgery. 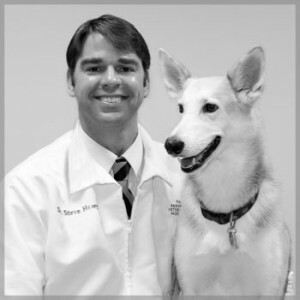 Steve remains active in the veterinary community, volunteering his time to projects with the American Animal Hospital Association and nonprofit organizations in the Portland Metro area. An avid outdoorsman, Steve spends most of his time outside the hospital biking, hiking, sport climbing and working on home improvement projects. He shares his home with his wife, daughter, dog and two cats.